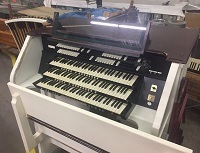 Over the summer, our organ was completely rebuilt by Austin Organs of Hartford, Connecticut. To celebrate the completion of this project, we have planned several special events during the 2018-2019 program year. On All Saints’ Sunday, November 4, we formally rededicated the organ. That morning, we had a special worship service with festive music and an order of dedication. Later that same day, Dr. Edward Allan Moore of East Liberty Presbyterian Church presented the dedicatory recital. Afterward, we had a reception in the parlor. At the reception, we had a variety of displays showing the work that was done on the organ, including pieces of the old action. In addition, we have established a recital series for the program year. This series will include a total of three recitals, including the dedicatory recital mentioned above. The recitalists and dates for recitals two and three are currently being determined. Further information will be made available in the coming months. These recitals will continue our celebration of the organ’s complete restoration and will serve as an opportunity to welcome people to our church. These recitals are made possible by the Tyson Fund.